We are able to offer a wide range of coffins and caskets to suit a variety of budgets and tastes. Our most popular coffins / caskets are shown below. Please call for more information. 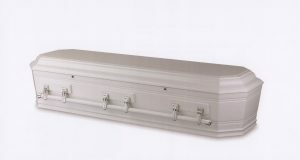 Please note, this is just a very small example of the range of coffins and caskets which we can supply. If you need our help to explain your options please contact us. Our coffins and caskets are available for an upcoming funeral or for pre-paid funerals. A totally cardboard coffin and one of our most popular choices. This coffin has a lovely plantation veneer satin finish with satin fabric interior. Suitable for people up to 120kg. Customised coffins to reflect the persons character. Personalised coffins utilise the latest eco friendly technology. Families can supply their own images and ideas to create their own personalised coffin or use a design from the Expression range. Eco Friendly Weaved Wicker Caskets. These caskets feature a linen fabric interior with biodegradable plastic lining and rope handles, perfect for an eco friendly burial. Other eco friendly caskets are also available upon request. This beautiful rose lacquered coffin is available in a range of colours, with a carved rose on the sides and lid. This coffin features a white satin fabric interior and silver matching woodbar handles. Sapelle Mohogany casket with a satin finish interior and high tier hinged lid. Grooved sides are complimented by matching gold woodbar handles. Hardwood casket with high domed lid, hinged half lid and corner posts. This beautifully constructed casket has matching timber extension bars with end handles. A velvet pearl interior with adjustable bed & mattress complete this beautiful casket. 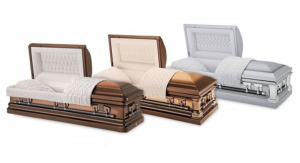 High quality caskets with many options to choose from in the range. These luxurious caskets come in solid wood or metal with adjustable bed & mattress and various accessories which may be added. Please contact us to view the entire range. Grecian Urn style casket with gloss finish and upholstered white satin interior. Matching sidebar extension woodbar handles compliment this beautiful casket. Dear Friends, for that is what you became, guiding us through one of the very most difficult times in our lives. From the ‘red rose on the pillow’ to the big bear hug you gave Kerren at the door, you made our day one of great memories as we honoured Brian, who meant so much to us.